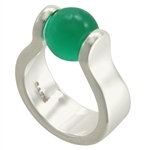 A Mod style setting with a flat band, it's a ring that makes a bold statement sporting a traditional sized marble. You'll love the looks you get! Includes the Player Marble Set. Just want to say I got the ring I ordered in the mail today and it’s by far the coolest thing I have ever ordered online. Thank you for making such a quality, beautiful product. I absolutely love it.